Best Buy Best Buy Yellow Tag Sale: Microsoft Surface Laptop 2 $1050, Cuisinart Immersion Blender $120, Amazon Fire TV Stick 4K $55 + More New Flyer! 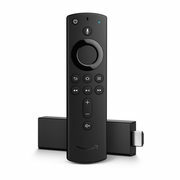 Amazon Fire TV Stick 4K $55 + More! 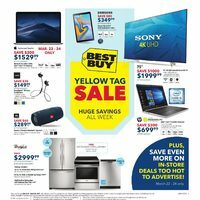 This 32-page flyer features Best Buy's Yellow Tag Sale, where you'll find hundreds of deals on tech and appliances throughout the week, including some unadvertised in-store-only deals! This flyer is effective online and in Best Buy stores (where available) from March 22 to 28. BestBuy.ca offers free shipping with orders over $35.00 (excluding oversized items) and a free in-store pick-up option with no minimum order. Amazon will continue to support these for years, while SmartTvs are not supported post release and you have to deal with crappy, slow, buggy native apps. Go for the firestick, Smart TVs are just regular TVs with Netflix and YouTube and with a very slim chance the apps will be regularly updated. When it comes to Smart TVs, think of the example of Modem/router combos, good idea, bad execution, you are always better off getting a standalone modem and a good quality router as the router that's built-in with the modem is usually sh!try, same applies to TVs. Get a quality "dumb" TV with no "Smarts" and the money you saved spend it on a quality streamer, like the Nvidia Shield or FireStick 4K. I have a smart TV and use a Fire TV Stick 4K on it. Obviously every TV is different but the built in smart TV features are very sluggish. I connect using WiFi too and my TV doesn't stay connected so there's a good 1-2 minutes after I turn the TV on before I can do anything. The Fire stick is always connected to my WiFi and it's ready to go the second I turn my TV on. I bought another one for my non-smart bedroom TV and it's been great. I just wish it had a YouTube app (yes I know I can side-load it) but using YouTube in the built-in browser isn't actually that bad of an experience. Can i use Fire Stick for IPTV? Bought the Fire Stick 4K in February from Amazon and been very happy with it. It replaced the Roku Stick (2016), which had worked well until Roku decided to remove IPTV functionality. One of my original concerns was that the Fire Stick does not have a native YouTube app. However it works exactly the same as how it was on my Roku, at least for my use cases. I can cast videos from my Android phone, no issues. The power and volume buttons on the remote are definitely a nice plus. Yes, I recommend the Tivimate IPTV client (premium), it is so silky smooth, def. worth the $7/yr, plus lots support/updates on Reddit from the developer. Note: You just need someone with android tv to do the initial upgrade as premium is processed via the TV app (not available on phones) through Google Play, then once premium is unlocked you can have up to 5 devices on premium, including Amazon fire TV/stick devices.